When I get through the surf zone I meet up with my partner. This could be a good time to get a short distance transfer (bow push) to deeper water where the switch will occur. See USK article, "Swimmer Assists". It is prudent to be a little farther out from the break zone than you think, because there are some sneaker waves that sometimes come in. You don't want to be switching positions and get surfed in at the same time. You also need to consider issues regarding the spray skirt. If your skirt doesn't fit the second kayak's coaming then it is useless. Can you fit into the skirt your partner has for their kayak? When does the timid paddler take off their skirt and when do you put it on? If the skirt has shoulder straps then you may have to remove paddle jackets &/or PFD's. If the skirt has a large enough tunnel, so it can fit over both paddlers head and shoulders, then the switch can be made while either is sitting in the cockpit. Otherwise it may have to be done in the water pulling it over your legs. When ready to make the switch I stabilize the timid paddlers kayak while I am in the water. There a a number of ways to do this so choose the one that works best for you. This is a good skill to practice with your partners when you have your capsize recovery practice days. I like being near the bow so I can watch the paddler get out of their kayak. I find a spot where one arm can reach under the kayak and grab the opposite deck line. The other arm reaches straight up to hold the deck line on the same side as my head. I get as close to the cockpit as my reach allows while keeping my head comfortably above water. This allows me to provide stability in either direction. Being able to see the paddler get out of their kayak allows me to anticipate which way they may be leaning so I can compensate accordingly. It is best if the paddler getting out of the kayak does it quickly as possible. Our goal is to not get water into the cockpit so we will not have to deal with draining water. This is another good skill to practice during those wet training days. Two paddlers trying to empty water from a swamped kayak while both are in the water. There are different philosophies about helping the swimmer through the surf. 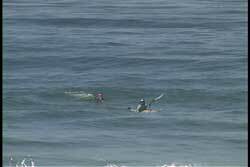 My personal opinion is not to have the kayak anywhere near the swimmer as they are in the surf zone. 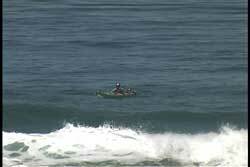 Once a sea kayak is in the surf zone you are mostly at the mercy of the surf. 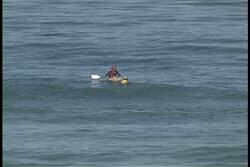 When I am in a kayak in the surf zone I don't want to run over any swimmer and I don't want them smashing into me or my kayak. I also don't want the resistance they will add if they are holding onto my kayak. I feel I can do the most good by landing first and then swimming out into the surf to help them if they need assistance. In fact, it could be a great time to use a paddle swim to get the two of you to shore. See USK article, "Paddle Swim". 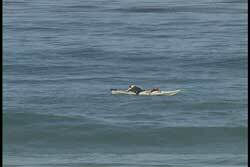 If the timid paddler is capable of getting in through the surf on their own and they want to do a paddle swim they could take the spare paddle (which you should have with you on the trip) and use it to get to shore. This will work if you left the spare paddle with the timid paddler when the first kayak landed. If you didn't bring a spare paddle (tempting the wrath of Neptune) then you will need to swim out with your paddle if the timid paddler needs their paddle to swim ashore. If you are going to be launching and landing in surf I feel it is important to get comfortable in that environment. The only true way to gain comfort is to understand the forces in that environment. Therefore, I recommend playing in the surf even before you learn to kayak in it. See USK article, "Tuning & Timing." Most of the time I will go out and body surf after the group has landed if there are decent waves. I enjoy playing in the waves and feeling the forces in the water. 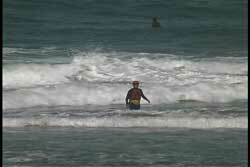 Body surfing, in through the surf, can be your fastest way to shore when you are swimming through the surf zone. In addition, the timing and take off points you learn while body surfing translates beautifully to surfing your kayak. I am not going to tell you that this technique will work in all surf zones. If you have a significant long shore current then you have other challenges. If the surf is huge then I would not recommend this as an option. Big surf provides additional challenges and risks. It is difficult to swim in the aerated whitewater. I once went out to body surf in big Hawaiian waves. I was feeling brave and wanted to give it a try (NOT one of my smarter moments). When I got halfway out I knew I was in trouble. I was surrounded by whitewater and waves were continuing to roll over me. I knew I needed to get to shore or blue water. Blue water was closer so I took the best breath I could and went down. I swam out as far as my lungs could take it. I came up ready to take a quick breath (if I could) and go back down. I was glad I made it out to blue water. The only reason I made it was because I had body surfing fins on. Now I had to think about getting back in. When the right wave came in I rode it toward shore. When it broke I knew I was going to ride it all the way in while holding my breath. It was a great ride and a very long breath hold, but I learned a valuable lesson that day about big surf and the aerated whitewater in big surf. 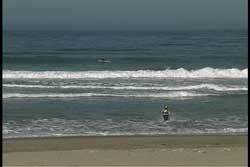 The length of the surf zone also needs to be considered along with the wave size and frequency. How much energy will it take and how long will it take to get out to your partner? As you can see, there are a number of factors that need to be addressed before you jump in and swim out. Landing a partner's kayak can be for a number of reasons other than feeling timid about landing in surf. If you have a very seasick paddler this may be the option you choose for getting the sick paddler ashore. Of course you can always just have the paddler in question paddle toward shore and bail out of their kayak when confronted by the waves and let the waves take their kayak to shore. I am not a big fan of letting waves tumble kayaks in the surf zone if I can find ways to prevent it. I once had to land a boat for someone in the group, because there was a rocky beach and they trusted my surfing skills more than their own. They had a new composite boat and they didn't want to smash it up. Thank goodness I was able to fit in the kayak. It gave me the opportunity to smash it up :-). If you do this for another paddler, discuss in advance that you will do the best you can, but you are not responsible for damages to their kayak.